Robyn Vilate: spring colors & feral watch giveaway winner! spring colors & feral watch giveaway winner! good morning lovelies and yay for monday being over! i haven't had one in a while, so i forgot what it was like to have a bad monday, but yesterday was absolutely a bad monday! everything that could have gone wrong, went wrong, and it seemed to never end. the end of the day ended up better doing a fun little shoot with a new cute boutique (photos to come soon) but as for the rest of the day, it could have not happened and i would have been just fine with that! with that said, i'm hoping for good things today. happy things. except i may or may not have an orthodontist appointment today, which i haven't had since i was 14, so this ought to be interesting! i'm sure i'll look slightly out of place with 20 middle school kids in braces! so wish me luck! i'm also going to throw it out there that you can plan to see me in lots of maxi skirts over the next few months, especially with this little tummy that is forming, we will be besties for a while. so hopefully you don't get too sick of them! ps. how cute is the print on this one?! also, congratulations to jenell- the winner of the feral watch giveaway!! 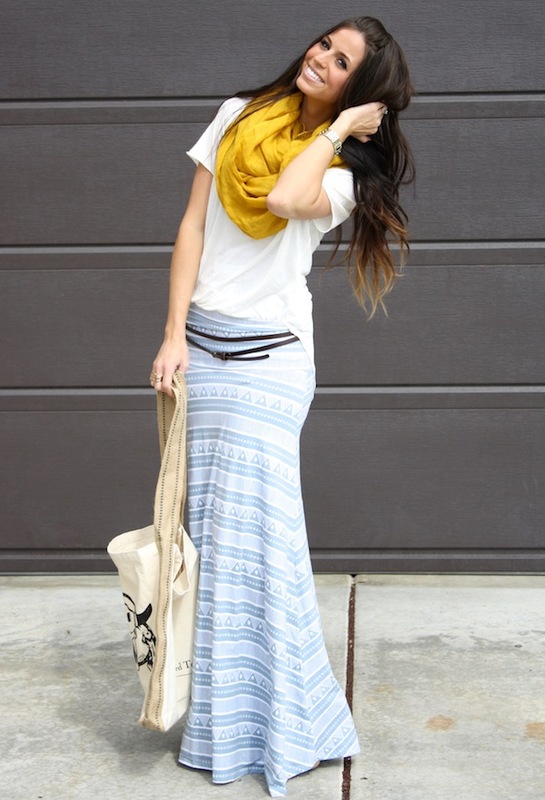 love your skirt and your scarf! I absolutely LOVE this whole outfit! omg girllllllllllllllll! I love this skirt!!! gorgeous skirt! love the colors you mixed in with it!! Love the skirt!!! And that color of the scarf is just perfect..
You are glowing! This website is awesome. Even though I'm not prego this spring, I'll be rocking the maxi too. So easy with the babe! Thanks! love the belt with the maxi skirt! and everything else about this outfit! That outfit is so cute! 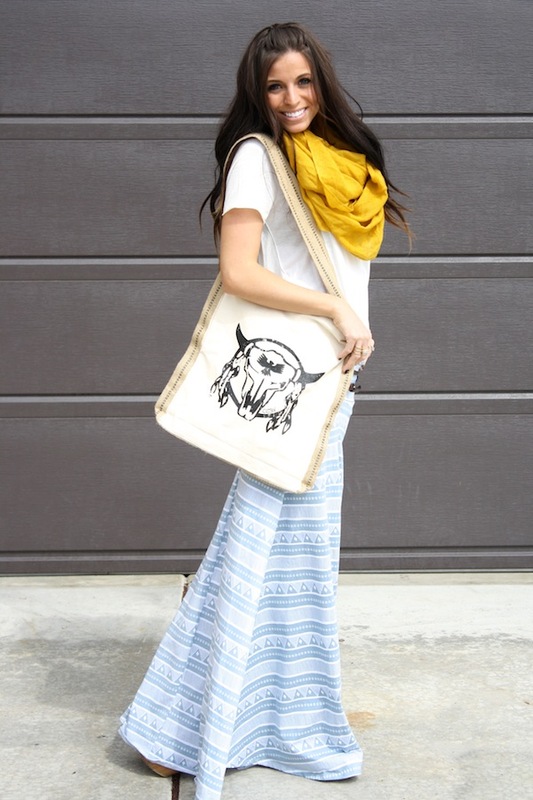 I love it :) I love the way that maxi skirt fits too! 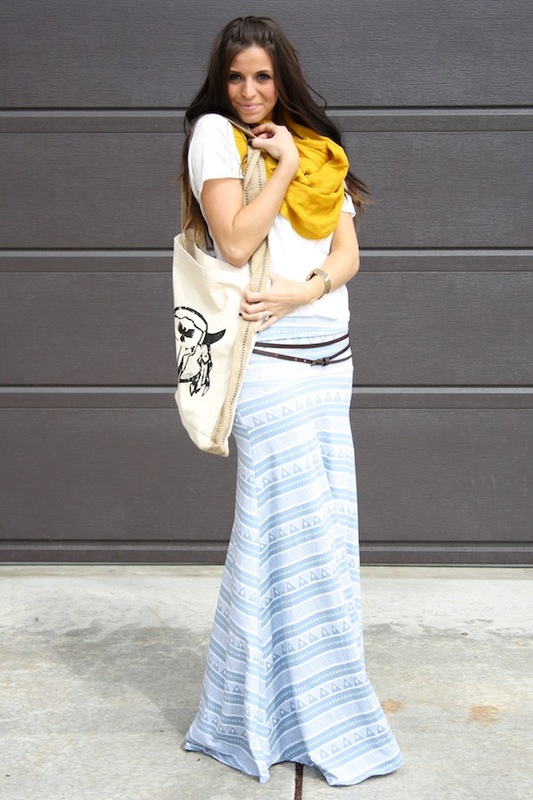 love this skirt- it fits you perfectly! You look adorable! SO great! Love this post...but that's not unusual! Love the skirt! It's so adorable! I'm dying over that skirt!! Love the light blue with the yellow scarf.